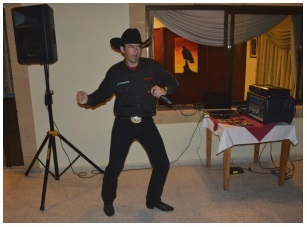 We have seen Devon (aka Mr Rodeo) perform on a couple of previous occasions and knew we were going to have a good night’s entertainment when he made a return appearance at Al Shaheen Restaurant in Karakum recently. We had invited some friends to join us and they thoroughly enjoyed the evening, saying they were so pleased we had asked them. Devon takes his name from the English county he comes from and he is well-known in various areas of the UK and also Holland where he regularly performs, so we are very lucky that when he comes to North Cyprus to see his friends Steve and Denise Bisson, we are treated to his very easy and enjoyable style of country music during his short stay. Steve and Denise run the Phoenix Line Dance Club and attend the Devon performances with some of the club members so we can always rely on them to get on the floor and show the customers how to line dance, which is very enjoyable. Devon has a wide range of songs which include many old favourites that people can dance to and it is not long before customers are up on the floor enjoying some rock and roll and twisting the night away or trying some of the line dance steps. 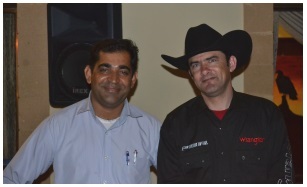 Imtiaz, Ashraf and their staff were very busy that evening with a large number of customers and we all enjoyed an excellent meal from the very extensive menu offered by the restaurant. If you didn’t get a chance to go and see Devon at Al Shaheen there will be another chance to see his performance at Soyz Bar in Ҫatalköy on Sunday 16th June starting at 6.30pm and Rafters Restaurant in Ozanköy on Wednesday evening 19th June. It may be advisable to book at either of the venues to avoid disappointment. If you have never seen Devon perform have a look at the following video, prepared by Chris Elliott, for a sneak preview. 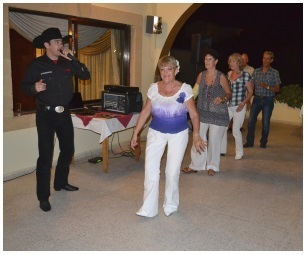 This entry was posted in Our Friends, Special Events and tagged Al Shaheen Karakum, Country music, Devon, Entertainment, Mr Rodeo, North Cyprus, Phoenix Line Dancers by kyreniacatkin. Bookmark the permalink.